The term automation defines the introduction in a manufacturing company of technical tools and processes aimed at reducing or even eliminating human operations. Indeed, the most relevant benefit of automation is the reduction of workload for the operators, which consequently leads to additional advantages such as reduced lead time, costs reduction and achievement of quality standards requested by clients. 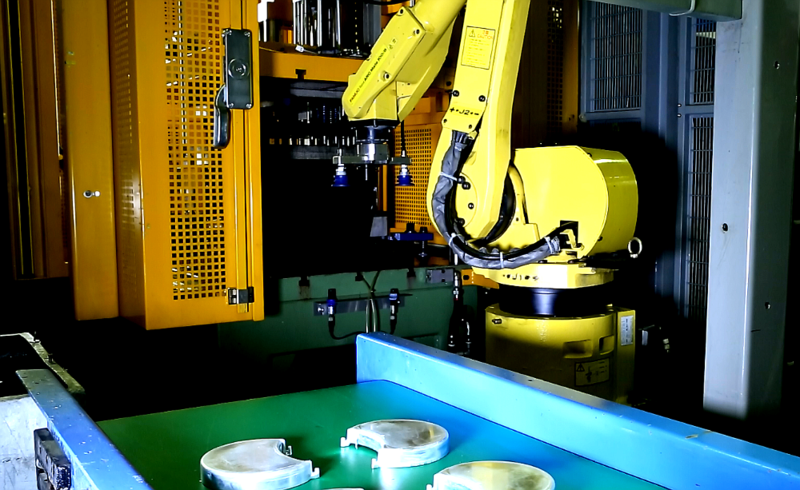 Automation can therefore contribute to production process improvement, enhancing accuracy, precision, productivity, robustness and consistency of outputs. In Bruschi we are always seeking for innovative solutions that can help improving the productive process. In order to fulfill this aim, the production department has developed a project for reducing operators’ workload with the introduction of automation. This project concerned two specific components produced for a client of the sector of small appliances and has obtained excellent results in terms of reduction of manual activities of operators and increased productivity. Results show that 0,05% of components generates 20% of the output produced by the company: these components are known as runner products. The presence of few components that generate such a substantial output allow the introduction in the production department of a specific automation without reducing productive flexibility of the company. Definition of the problem, identification of the causes and hypothesis of corrective actions to reach expected objectives. 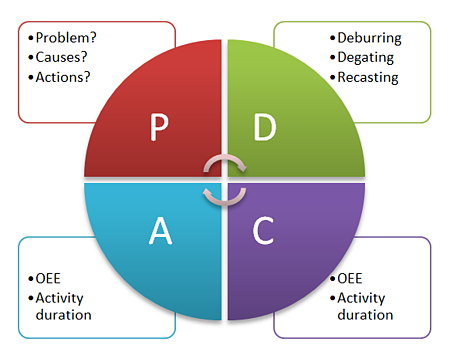 Implementing corrective actions defined in phase 1. Collecting and checking data. Comparison between expected results and observed results. Implementing corrective actions emerged from data analysis of phase 3. The first phase starts with the definition of the problem: a condition of misalignment between production capacity and client’s request, with hypothesis of producing both the components on the same die casting machine due to plant saturation. Therefore, the problem can not be solved producing the two components on two different die casting machines: it is in fact necessary to improve the production process of the components. 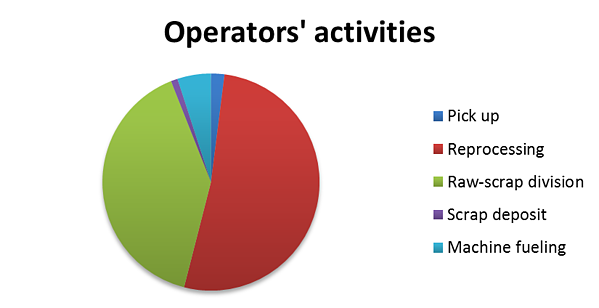 Once average duration of every single activity has been calculated, improvement focuses on activities that can generate more benefits, so the ones that take up the most of the time of the operator. Manual activities that have been selected are reprocessing, raw-scrap division and die casting machine fueling: these activities take up 97% of the operator’s time. First of all it is essential to work on NVA activities, in order to understand how to eliminate them. Secondly, NNVA must be analyzed and improved. Normally, VA activities can be improved but with little margin. The comparison of these indicators before and after improvement actions has highlighted +33% OEE and -95% manual activities, with a complete recasting of scrap material. Phase 4 has not concerned any action because after KPI analysis no anomalies were observed. The project has led to several benefits for the production department, both direct and indirect ones. This case study demonstrates the importance of automation in a productive system that is efficient and technologically advanced: through the introduction of automated systems it was indeed possible to meet qualitative and quantitative standards demanded by the client, meeting the requested deadline at the same time. To always be up-to-date on zinc die casting industry news, subscribe to our blog.